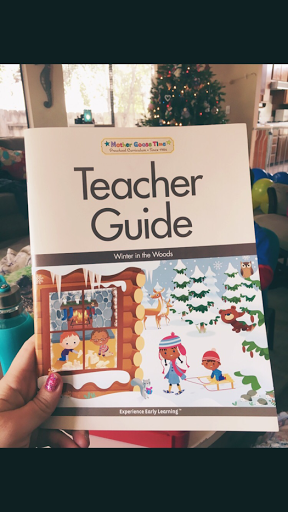 The "Winter in the Woods" theme this month for Mother Goose Time (MGT) has been so much fun. I love the theme, I love the art, I love the manipulatives for the month. I love all of it. So does Jack the Standard Poodle, incidentally. 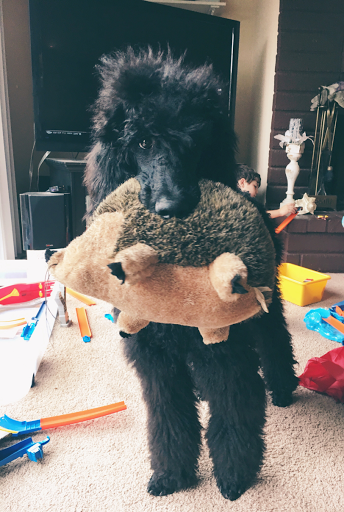 He took a real interest in the Hedgehogs process- based art lesson, being that his favorite toy is his very own hedgehog. I wanted to show you the little bit of a different turn MGT has taken with art this year. Fifty percent of their art projects (I believe that's the correct number) are now process-based instead of product-based. Essentially this means that the focus is put on the actual making of the art project and not on what the end product looks like. It can be confusing for parents to see some of these projects as they typically might not turn out as "beautiful" as a product-based project would. Parents might not even be able to tell what the art project is without their child describing it to them. 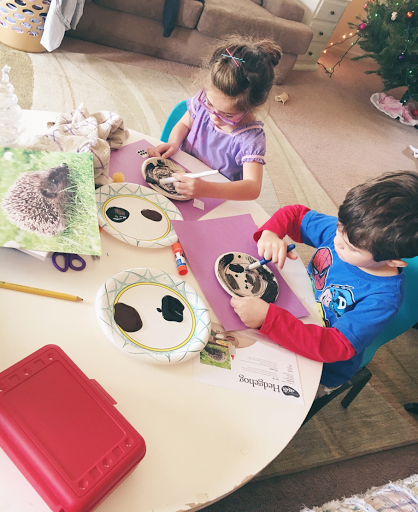 As a homeschooling parent who actually does these projects with my children, I can assure you that they are taking part in a beautiful learning opportunity. This is the Teacher Guide for the month. Isn't that picture adorable? I remember last year's winter picture being adorable as well. 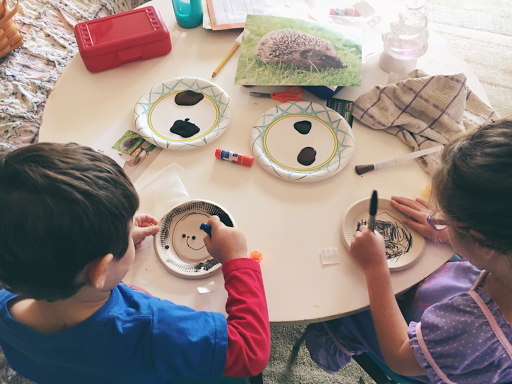 The Teacher Guide contains the lesson plan for the "Invitation to Create" which is what the process-based art projects are called. However, a "recipe" card is also included with each project. I love that I can leave it on the table for easy referencing. 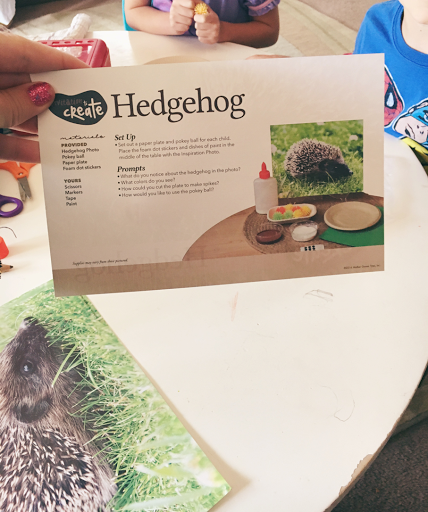 I gave my kiddos the materials and we discussed hedgehogs. We referred to our prior knowledge we had regarding these animals as well as the new information we had learned. Both chose to start with using a paint brush and paint. Tiny B progressed to using a Sharpie. The project took them roughly ten minutes to complete once they started creating. 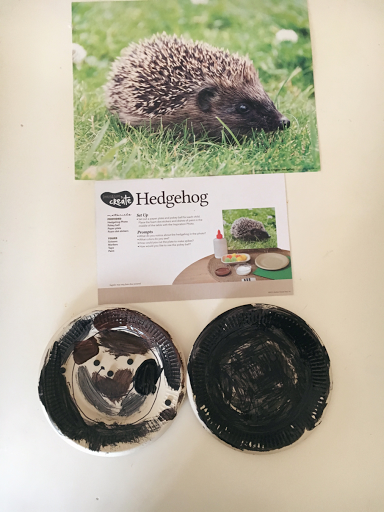 There was discussion about hedgehogs, why she wanted to use a Sharpie, why he wanted to make a smiley face, and if they needed more paint. The end product would certainly not be inspirational to someone who had not seen the discussion that took place before, during, or after the making of the project. Tiny B's looked like a blob of black paint. But I can assure you that she went through a big thought process to create what she did and she learned that layering marker and paint is not going to leave her with a product that looks exactly like she had pictured in her head! If I had given her the "correct" steps (really, what are the correct steps and does that even exist in art?!) she wouldn't have learned all that she did with this project. Where someone might see a black blob, I see quills of different colors and a cute nose that is now covered and a former micropreemie who is truly learning how to perfect her fine motor skills that were once so troubling to her and us. 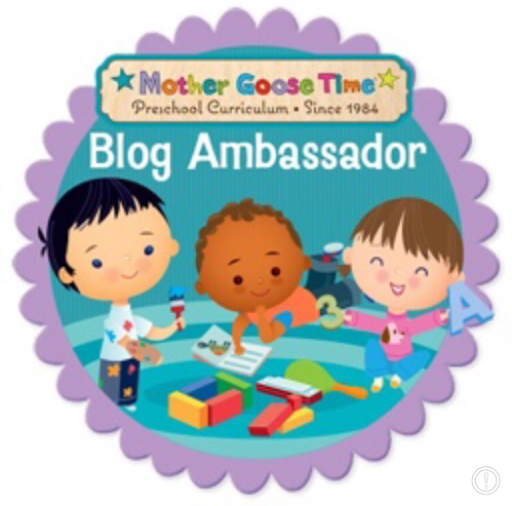 I receive Mother Goose Time curriculum in exchange for my honest sharing of experiences, resulting from our personal use. All opinions/thoughts are my own and are in no way influenced by others. Denise Austin Program Week 8: Blog Post 6! Mother Goose Time Coloring Sheets? !